Fall hikes are my favorite. The leaves are changing color, the mosquitoes are dead, and the weather is cool enough you aren't too hot in hiking pants. And surprisingly, one of our Sioux City city parks offers a great Iowa hike with a view of the Missouri River, varied terrain, wildlife, and even a little bit of spooky history! Ravine Park is located at the intersection of Lincoln Way and Lewis Blvd, and is 120 acres. The entrance of the park has a small gravel parking area, then a bridge across the ravine to get to the rest of the park. My kids love looking over the bridge, and if it has rained enough, you can even play Pooh Sticks (basically, stick races, but we call it Pooh Sticks because it is mentioned in the book The House at Pooh Corner--let each kid choose a distinctive stick, then everyone tosses their sticks in the water from the upstream side of the bridge, then everyone runs across to the other side of the bridge. Whoever's stick appears from under the bridge first wins). This is like a quarter of the stairs...it is very steep! On the other side of the bridge is an open grassy area that would be nice for playing ball or Frisbee, and a picnic table area. Near the picnic table area is a set of steep wooden stairs. This is the way to the trail. There is a bench most of the way up to the ridge, so that is a great place to stop to catch your breath or drink water or whatever you need to do. Once you make it to the top of the ridge, you can go left to hike along a grassy ridge and then down into the forested area around the ravine, but my recommendation would be to head right first, and keep going until you get to the "First Bride's Grave". The grave is a stone monument inside a gated area. 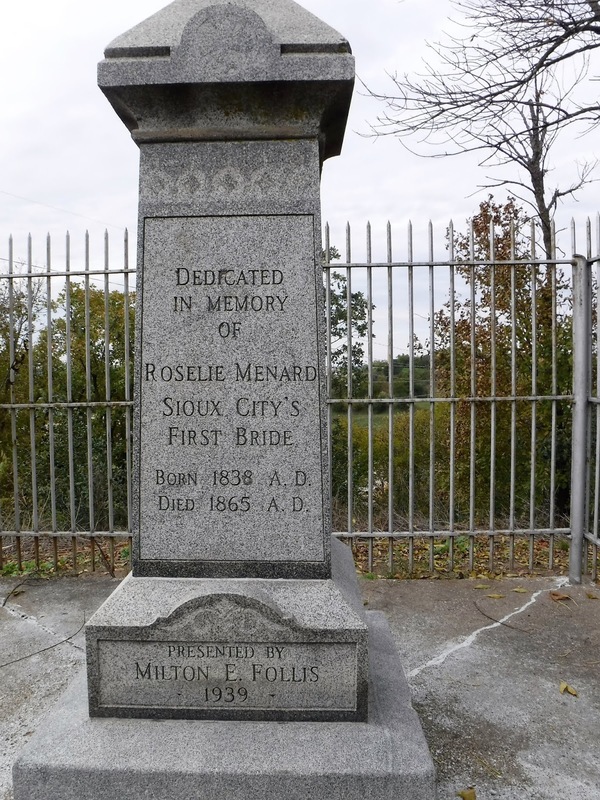 Rosalie Menard Leonais was the bride in the first recorded marriage in Sioux City, to pioneer Joseph Leonais. You can see a reproduction of their log cabin, along with more information about the pair, in the Sioux City Public Museum! The grave and the trail to it/from it are both quite close to the edge of the ridge. This means there is an amazing view of the Missouri River, Nebraska, and even a bit of South Dakota, but it also means it is very dangerous--kids running off here could be fatal, not just frustrating--so I recommend all kids under 8ish be held or have their hands held. From the grave, you turn back the way you came, and either go back down the stairs, or keep going straight along the ridge. If you choose to continue along the ridge path, you'll come to an area full of tall grasses. The city does mow back here, but hasn't recently so it was taller than me! 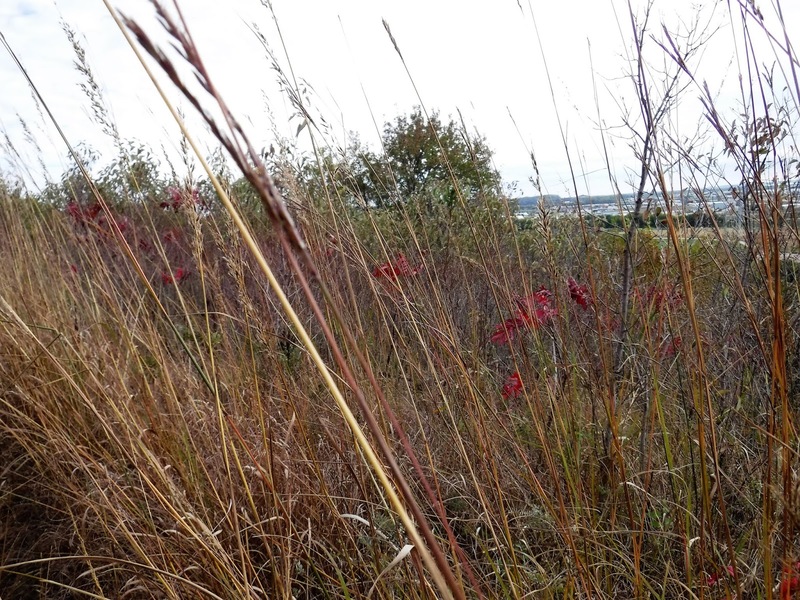 There are great views up here, both gazing down at Siouxland, and of interesting plants and grasses. 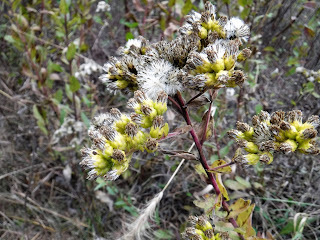 In fall especially, I love the variety of leaves and grasses changing colors! The trail takes you past an industrial tower of some sort--maybe a radio tower?--and then keeps going for quite a ways. Eventually you turn left and head down into the forested area. The forested area was my family's favorite! There were some trees down on the path that we had fun climbing over, but nothing dangerous. We also saw at least two whitetail deer romping around in the woods. My 9 year old was especially intrigued by a tree we dubbed "the treehouse" because it had 3 boards nailed to it like the entrance to a treehouse. However it looked like they must have been nailed in a long time ago, because one had twisted around to a different side of the tree, and the remaining two were too far apart to climb successfully. I reached out to the city's parks & rec department to see if they know anything about the history of this tree, and I will update this post if there is a fun story to share! Eventually there's a fork and you can go around the ravine and come out on Lincoln Way a couple blocks from the parking area, or head back to the clearing near the parking area. 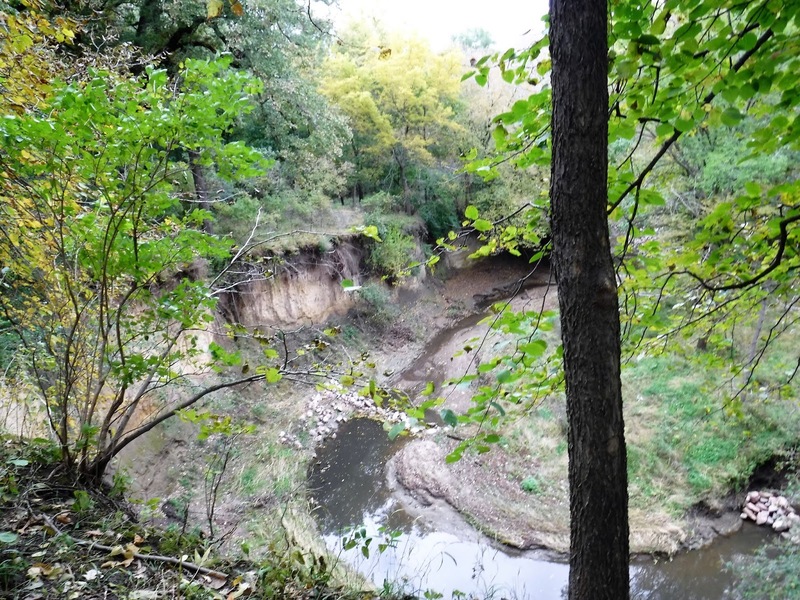 There are some parts of the trail in the forested area where you are very close to the ravine and again, it would be very dangerous to let kids get too close to the edge. There are lots of little hills through the park, and if it is muddy, I recommend hiking shoes or boots, or running shoes with good traction. In all, hiking to the First Bride's Grave and all around the ravine and back to the clearing at a pace a kid could keep up took us between an hour and a half and two hours. 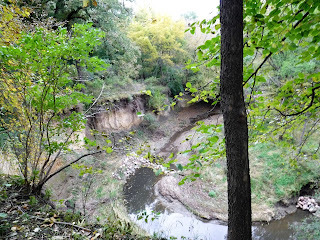 The ravine trail alone or to the grave and back would both be great options for shorter hikes. 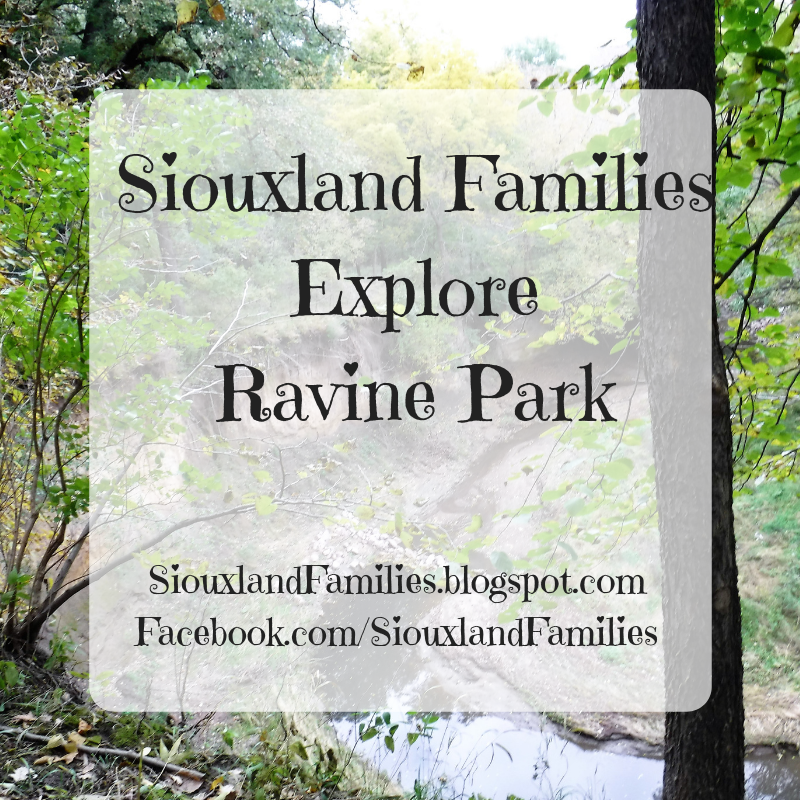 Our family always has fun hiking at Ravine Park, and I hope yours will too! 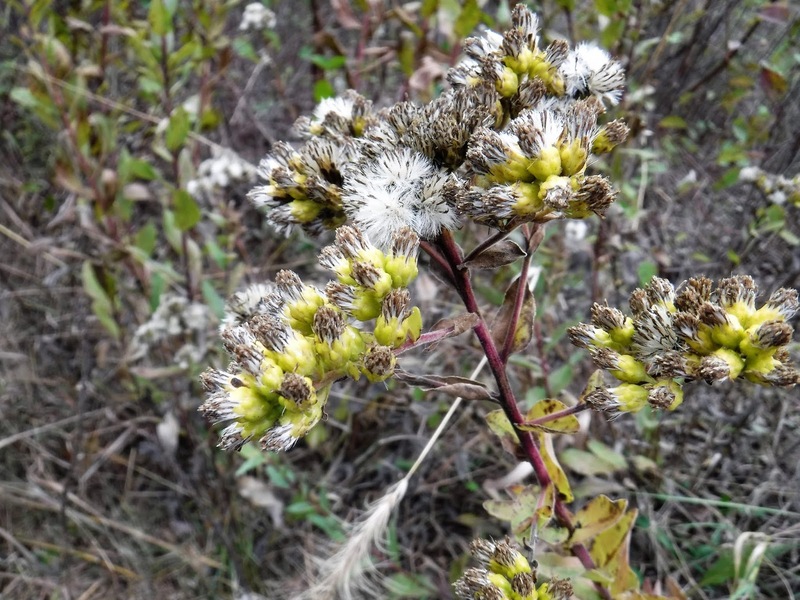 For more posts about places in the Sioux City area to hike and have adventures with your family, visit the Explore page.